November 11, 2016 is the fourth Veterans Day I will bring my show to the Reif Center for the Performing Arts in Grand Rapids, Minnesota. The public performance is November 10, then I have a student performance and a senior center engagement on November 11. My last trip included a surprise at the senior center. Resident James Trembath had earned a Bronze Star medal for heroics at the Battle of Iwo Jima in March, 1945. However, Trembath's son told me there had never been a public ceremony for his father's Bronze Star. The award citation arrived in the mail seventy years ago and sat in a file in his father's house. So the son asked if I would read it aloud at the Senior Center. I said of course, and the son handed me the citation. With James Trembeth, awarded a Bronze Star for heroics at Iwo Jima. Everyone in the room welled with tears as I read the description of the actions of the modest old man they thought they knew well. At Iwo. Jima Trembeth spent three hours running through enemy bullets, hopping from one wounded soldier to another to bring relief. Amidst the hell fire of the raging battled he'd land in a fox hole with his medic's kit and ask, "what happened? I'm here to help you." As I read the description of his actions I didn't dare make eye contact with James Trembeth, his son, or anyone else. He'd waited seventy years to have his actions finally recognized in public, so I didn't want my emotions to screw up his moment. The citation is below. Please take a couple seconds to read it. James Trembeth's Bronze Medal Citation. When I read it aloud at his Senior Center two years ago it was the first public acknowledgement of his medal. Three of the widows at the Senior Center had husbands who served in World War Two. One of the husbands spent months in a German prison camp. As we talked more, the seniors opened up and shared many stories, including how the nearby mines of the Minnesota Iron Range worked round-the-clock to supply the war effort with its essential commodity, steel. Many of the residents spoke fondly of how united the country was during the war, and how they missed that. I asked if they felt united by our conversation. They laughed and agreed, were we united. I told them I feel the same every time I talk to people who lived through the war. Frankly, I feel it whenever I do the show. Reif Center, Grand Rapids, Minnesota show poster. The first time went to Grand Rapids the show was still called "The Mushroom Picker" (seemed like a brilliant title at the time) and the Reif Center's director, David Marty, had to be talked into bringing me. The quote I've been told is, "some guy telling war stories about his grandfather -- I fall asleep just thinking about it!" Against David's better judgement, he booked me. Then he and his staff sold out their 400-seat house and the audience response was electric. Just amazing, a high point of my first tour. After the show, David came on stage and we chatted for over an hour. He strongly encouraged me to make the show a priority in my life because it is an important story for people to hear. He thought the show had the chops to tour nationally. He encouraged me to dream of what might be possible, and I've been running on that encouragement ever since. In a few days, I'll be back on David's stage. Sign in a barber shop, Grand Rapids, MN. The second time David had me to Grand Rapids I met a WWII vet who knew my grandfather. They were both stationed at Fort Sam Houston in San Antonio, TX before the war. And like my grandfather, the Grand Rapids veteran made it through 11 months of combat with just a few minor injuries. He brought books from the Second Infantry Division, including a roster that showed the division had as many casualties as men serving, 15,000. That is a 100% casualty rate; only constant reinforcements kept their numbers up. He and I traded stories, laughed a lot, and then he saw the show with his daughter and grandchildren. David Marty made sure that he and all local veterans attended for free. This next Grand Rapids gig is sandwiched between trips to Rochester, NY, New Orleans, and a gig at the George H. W. Bush Museum and Library in College Station, TX. It will be a return engagement to the Bush Museum and Library, as that organization has also become a champion of my show. George H. W. Bush was the Navy's youngest pilot in WWII, and then was president when Soviet Communism fell. Veteran's Day this year falls just three days after the election. James Trembeth didn't care whether a foxhole was Republic or Democrat, conservative or liberal. Those men crying for help were simply Americans. And when I visit the Grand Rapids senior center this Friday I am certain the residents will comment on how united the country was back during the war. And when we talk about our country's shining moment of the 20th Century, we again will be united. World War Two veterans with me in Rochester, NY after a performance. Grandpa filmed the joy of the liberation of the Holysov Concentration Camp in Czechoslovakia. The women in the striped uniforms in the clip below are Jews from Belgium and France, slave labor finally freed in May, 1945. Grandpa arrived at the Holysov camp as they were liberated. My grandfather's ability to speak Czech was his passport into a wide range of adventures in the last week of the war. The US Army desperately needed translators as they liberated Southern Czechoslovakia, and Czech was grandpa's first language. What had made him odd within his division -- the only officer whose native tongue was Czech -- suddenly made him quite valuable. Above, grandpa looks like a rooster in a hen house as the freed female prisoners crowd around him, vying for his attention. He also wrote that the women in the Czech towns he helped liberate kissed and hugged him. I chuckle at the thought of my grandpa as a George-Clooney-in-combat-boots, but apparently it happened. Holysov was one of 80 sub-camps of the Flossenburg Concentration Camp in Germany. Over 30,000 people died in the Flossenburg camps. I visited both Holysov and Flossenburg with my guide and dear friend, Amar Ibrahim, on my recent research trip. As we drove along I began to notice dead bodies on the right and left of the highway. This puzzled me as I knew of no battles in this area. I noticed they all wore the same uniform, all were above apparent military age, and all shot through the head; some with one and some with two bullet holes. After a few stops to take pictures, my driver called my attention to some men coming down a hill from the woods, waving their hands. I asked them (in Czech) who they were and what they were doing in this area. They told me that they were escapees from a column of thousands being moved from concentration camps in Germany and that the tail end of that column passed the point we were at not more than fifteen minutes ago. Three days before, the inmates of the camp were told to assemble to move out of the camps. With little food and water the prisoners were formed as a road march unit and, guarded by SS German prison guards who road vehicles, put on the road. Their marches were mostly during the night as they did not want to be spotted by American airplanes during the day. I asked them about those dead along the road and how they happened to be shot. They told me that these dead were members of the prison camps and march unit. They said that the gruesome march in the warm spring days caused many to fall out only to be shot as the German SS came upon them as he road in his car. They said that when a man became exhausted and about to fall, his buddies on the right and left of him would take the exhausted under their arms and just about carry him until all three became exhausted and all three fell out of formation on the road and then all three were shot and dumped in the ditch. This explained to me why I saw a single body here and there and then again I saw three in one pile dead. My grandfather got the men food and water. They took him to a building of about 100 other escapees, many sick and dying in front of him. He noticed dogs in the building and asked why they kept dogs if they had no food for themselves. This scene was a pathetic one and I was helpless. The answer I got was unexpected; they said they ate the dogs. I noticed a little dog and went over to pet him, much to the delight of the many in the camp. This little dog was picked up along the road and carried as he was too small to walk too far. They told me they were saving this special pet for the day they would have to eat him as a last resort after all other dog meat was gone. Now that I came there, they told me that I saved his life. I arranged to have farmers get whatever potatoes, beets, or bread and bring it to the se people along with water. I asked two medics to get medical supplies to the escapees. I bid goodbye and proceeded to the next village, Klenci. From that horror scene, my grandfather and his driver entered Klenci, coincidentally the home village of his grandmother, Mary Hruska (my great great grandmother). While snooping around town he stumbled upon a meeting of the Klenci resistance. As he walked into their secret meeting, the men were surprised to see an America officer, and then shocked when he spoke Czech. When he told them in Czech they were now free the men burst into joy, hugging and kissing him. They also marveled at the good fortune to be, as they said, "liberated by one of our own," as all four of grandpa's grandparents had immigrated to America from this little area of Czechoslovakia. The men made him a folk hero, less than an hour after he had left the hell scene of the dog meat. Grandpa never spoke of the death march, but he did yell at anyone in his house who threw away food. I learned that the hard way. He did write about his experiences, including what is quoted above. He also filmed the liberation of the Holysov Concentration Camp, and the disturbing scene below of German citizens forced to exhume dead bodies in shallow graves outside the Czech town of Volary. A column of the Flossenburg death march passed through Volary and the dead were just piled in a mass grave. They were like the fallen death marchers my grandfather found after crossing into Czechoslovakia. I wonder what my grandfather thought as he filmed it, bodies like the ones he saw as he crossed into the land of his grandparents. I knew my grandfather well and was a pallbearer at his funeral in 1983. But it has only been in the last two years that I've discovered what I've written about here. In fact, up until a few years ago I did not include the Holocaust in my show, The Accidental Hero, because I wasn't certain if grandpa's description was accurate. I needed proof. I discovered the movie clips two years ago in a canister of film that sat unwatched in my aunt Jean's basement for decades. Then my Czech friend Amar Ibrahim unlocked for the meaning of the clips for me. I had my proof and changed the show. On my recent trip to the Czech Republic Amar took me to the Flossenburg Concentration Camp. His grandfather, Arnost Hruska, had been imprisoned in Flossenburg during the war. The Nazis rounded up Arnost and 150 other men from Domazlice, Czechoslovakia in 1940 and threw them into Flossenburg in retribution for the resistance activities of a local native, Jan Smudek. Arnost Hruska was a successful businessman in Domazlice, his stately building on the main square sits just five doors down from City Hall. The Nazis made an example of him, a display that no Czech regardless of position in life was safe. Lucky to survive hard labor in the Flossenburg granite quarry and the daily presence of death, Arnost returned to his family weighing eighty pounds. Today, Arnost Hruska's white and salmon building on the main square sports a bronze plaque dedicated to my grandfather. Grandpa had parked his jeep in front of Arnost's building on May 4, 1945, his first visit to Domazlice. Grandpa looked up and saw his grandmother's name, Hruska, on the side of the building. Now my grandfather's name is on the side of that building, along with a bronze relief of him being carried as a hero by the people of Domazlice. Amar Ibrahim and his daughter with me in front the plaque of my grandfather, Lt. Col. Matt Konop. Amar and I are good friends. He lives in the Hruska building where he keeps a museum to my grandfather on the second floor. If you visit Domazlice he'd be happy to show it to you. These war stories are personal. Amar's grandfather and family were victims of the Nazi terror reign, while my grandfather's story has connected me to my Czech roots. On the train ride from Domazlice back to Prague after spending a few days with Amar, I re-read my grandfather's writings. I discovered, with the Czech scenery passing by the train window, that our grandfather's had met. Yes, these stories are personal, often terrible, and sometimes magical. I managed to drive to Klenci and Domazlice to see what I could discover as to my forefathers. The first place I stopped in Domazlice was the Hruska building where I met Arnost Hruska, operator of a general store. Matt Konop carried in the main square of Domazlice, Czechoslovakia on May 4, 1945. The photo was taken a few meters from Arnost Hruska's building. Note the movie camera in my grandfather's left hand. 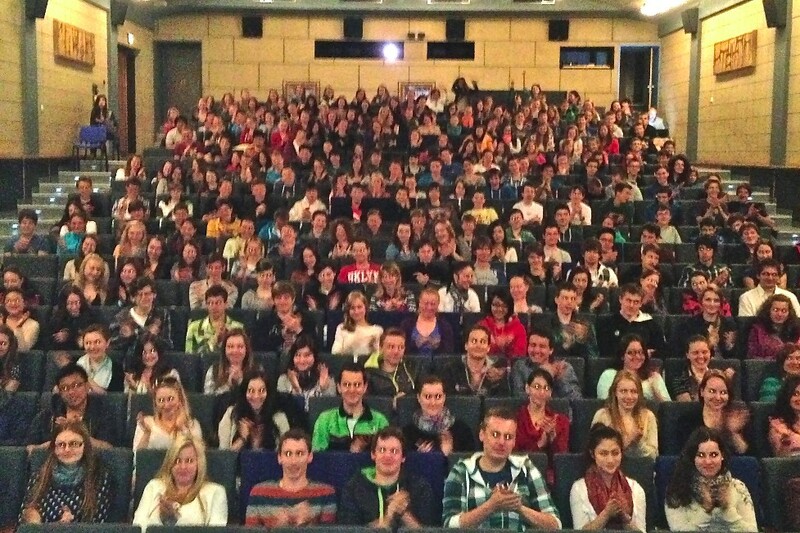 For the fifth year in a row, I took my show to the Czech Republic. Highlights included my grandfather being made an honorary citizen of the Czech Republic, two sold-out student shows, the Czechs of the town of Domazlice surprising me with a pewter copy of the bronze plaque of my grandfather, my second engagement in the town of Klatovy, and new revelations about my grandfather's time in Cold War Czechoslovakia. A commemorative coin was also created in honor of my grandfather's extraordinary experience at the end of WWII when he helped liberate the same villages his grandparents came from. Plans are already being made for the May 2017 tour. It is a great time to go to the Czech Republic, as they have many celebrations honoring the US Army's liberation of a portion of the country. If you are interested in coming along, please let me know! A fan of my show, Ben Jones of upstate New York, came along this year and had so much fun he'll be coming again in 2017. We might do a live broadcast or webcast of the show next May in the Czech Republic. Matt Konop and his brother-in-law, John Bauknecht, find each other in a clearing during the Battle of the Bulge. On day four of The Battle of the Bulge Matt Konop again ran into his brother-in-law, John Bauknecht. Konop had feared him dead. Instead, there they were in a Belgian clearing, sharing news about Two Rivers, Wisconsin. A British Spitfire plane overhead suddenly dove toward them, machine guns blazing. Those pesky Germans! First they're dressing in American uniforms, now they're flying British planes. With Konop guiding the line of fire, Bauknecht machine-gunned the plane until it began to smoke and burst into flames. The pilot ejected and parachuted, the plane then crashing a few hundred yards from the clearing. Konop and Bauknecht then returned to the latest gossip from Two Rivers. December 18, 1944: War is for the birds. Specifically, the St. Louis Cardinals. "Who won the World Series?" Matt Konop had no idea. He disliked sports and wasn't amused by the stupid question. In the chaos of his division's retreat, he was in the woods searching for places to store artillery and found himself under suspicion of being a German spy. Konop's odd accent -- a mix of his native Czech and a Wisconsin farmer dialect -- had the checkpoint MPs thinking he was one of the hundreds of German spies that had snuck in the night before wearing American uniforms. When Konop pulled a knife on his interrogators -- a German knife no less -- that settled it, he was German. Off to the stockade! German spies caught that day in American uniforms were shot, in accordance with the rules of war -- you can’t dress in the other side’s uniform. Seventy-one years ago today, Konop had no idea how close he was to the firing squad. He also didn’t know that the dark humor of his predicament was classic Czech comedy, echoing a scene from “The Good Soldier Svejk,” the most translated novel in Czech literature. In the novel, the main character, Svejk, is an Inspector Clouseau/Mr. Magoo-like Czech soldier who bumbles his way through World War One. Like Konop, Svejk was captured by his own army under suspicion of being the enemy. Matt Konop, who the day before held off a German attack with cooks and drivers, had gotten himself Svejk-ed. Finally, after a series of record checking, the US Army determined Matt Konop was an American and they let him go. Then at the next checkpoint he was captured all over again. Still speaking in his Czech accent (he didn’t learn English until he was six), still unaware of the new password, still not knowing who won the 1944 World Series (it was the St. Louis Cardinals). Lt. Colonel Matt Konop filmed the Distinguished Service Cross being given to General Walter M. Robertson for his leadership in the Battle of the Bulge. Before dawn, December 17, 1944: "Konop! Organize a last-ditch defense of the Command Post! Enemy tanks have broken through and are coming your way!" Matt Konop didn't recognize the voice on the other end of the phone, that's how hysterical his boss, General Walter Robertson, was. The unthinkable was happening: the Germans were attacking with a massive force and Konop's rear-guard Command Post was now facing the point of the German spear. Plus the Command Post was sitting virtually unguarded, as Robertson had just reassigned Konop’s defense platoon to carry stretchers for the wounded. And now Konop and a few cooks, drivers and MPs were all that stood between the German SS and a massive breakthrough that would lead the enemy to their goal: the sea. General Walter Lauer of the 99th Division later commented that at this Belgian crossroads the enemy had the key to success in its grasp but failed to realize it. Instead, Konop and his improv troops knocked out enough SS tanks for the Germans to pull back and search for a softer route. Total disaster avoided. The Battle of the Bulge would rage for weeks, the largest battle in US Army history. Most of the 15,000 men in 106th Infantry Division were killed or captured on December 17, but my grandfather's division retreated to higher ground where they wouldn't give another inch to Hitler. General Robertson, for his leadership in the Battle of the Bulge, was given the military’s second-highest honor, The Distinguished Service Cross. Here is film footage shot by Matt Konop of Robertson being awarded his Distinguished Service Cross. Rare World War Two film footage shot by Lt. Colonel Matt Konop in December, 1944. Lt. Colonel Matt Konop’s diary, December 16, 1944: "What an awakening! The sky was red as the heavy enemy guns shelled our division area, including our Command Post at Wirtzfeld." They all wanted to believe it was just a retaliation for the 2nd Infantry Divison's attack on the German border. But what about those rumors German tanks roaming in the woods? Nonsense. That was just the 106th Division seeing ghosts. Those green horns of the 106th were fresh from the US, a division that included high-IQ intellectuals and artists like Kurt Vonnegut. What did they know about combat? It was just another Saturday with the Germans on the run. General Eisenhower was at a wedding in France, Hemmingway was drinking in Paris and actress Marlene Dietrich was entertaining the troops just a short drive from Matt Konop's sleepy Command Post. And when he turned in that night, all seemed calm. Why Didn't He Talk About World War Two? It's the most-asked question. Last night, a woman asked it right after the show. I'll never know for sure. But I've thought about it a lot. I used to beg my grandfather to tell me about World War Two, but he wasn't talking. I'd learn about the war in school from nuns who had to try to imagine what had happened, yet my grandfather -- someone I'd known my entire life -- was an officer in the war but wouldn't say a word. It didn't make any sense to me why grandpa wouldn't talk. The woman after the show last night offered an answer to her question, "was it the trauma?" Yes, I said. I think the trauma was a big part of why he didn't talk. The woman's father had been in the war and he, too, didn't talk about it. She wasn't even sure where he had served, a fact that made her quite sad. My grandfather might not have talked about it, but he did write about his experiences. Although even that was strained, as nobody in the family knew what he was doing. He had no plans to publish his writings and didn't tell anyone what he wanted done with them. They sat in my aunt's basement for 20 years after he died. My sister stumbled upon his memoir about ten years ago and made copies for family members. I was shocked with what I read. Shocked, and then obsessed. The obsession led to my one-man show, which has taken me and grandpa's story across the country and to Europe. And when I do the show, I always get asked this question about why he didn't talk. My grandfather was in combat for eleven months straight, with but a few breaks. My aunt told me a story of a family vacation to Chicago in the 1960s. It was a beautiful summer day and the family was walking along the shore of Lake Michigan right near the Shedd Aquarium. At the time, a small airstrip was next to the aquarium and when a single engine plane made its landing approach my grandfather jumped under a park bench and started yelling at the family, "get down! Get down!" Traumatized? I think so. Why anyone want to talk about something that dark? Even if you did want to talk about it, how do you have such a conversation? Someone who has been in combat knows that no matter how well they describe it, a person who hasn't been there will never understand. Plus, culturally the WWII generation just didn't say much about such things, any more than women of that era would talk about the details of child birth in mixed company. And many of the WWII veterans I've talked to have said to me things like, "we fought the war so we could live in the peace," and "that was then and this is now." My sense is they didn't want to get stuck reliving the war. At the same time, many do want to talk about it before they die. I think this was part of my grandfather's impulse to write about his war experience. He wanted someone to know. So he told his typewriter. And his typewriter never asked stupid questions or made eye contact. I still can't believe how close we came to never finding out about his story. In fact, the woman last night after the show pointed out how lucky I am to have his writings. Yes. Lucky indeed. Patrick Dewane with US Ambassador to the Czech Republic, Andrew Schapiro at the 2015 Domazlice, Czech Republic liberation celebration. We also have his film footage, which might even be crazier than discovering his long-forgotten writings. Above is some of what he shot when he and his young family were stationed at Fort Sam Houston in San Antonio, Texas. My mom is the youngest of the three children in the video. Clearly, grandpa liked to document things, even if he didn't talk much about them. I get to hear a lot of stories after I do the show. Funny stories. Amazing stories. And sometimes horrific, heart-breaking stories. I heard a WWII veteran in my hometown tell of a kamikaze dive that exploded on the deck of his ship, right in front of him. He snapped. I realized later that day that the man who told the story had worked at my high school when I was growing up. None of us at the time had a clue as to the trauma he'd experienced. He didn't talk about it. But he paid one hell of a price and finally later in life received treatment for his trauma. I don't presume to be an expert on war trauma. But it was interesting last night that the woman asking the question went right to that answer. For my grandfather, I'm pretty sure his trauma was a major factor in his silence. For the veteran I mentioned above who survived the kamikaze attack, he told me as much. Ultimately, my grandfather did tell me about the war. He did so in a way that was comfortable for him, and has changed my life incredibly. Who caries a movie camera in World War Two? My grandfather, Matt Konop, did! In his left hand above is a Kodak 8 mm camera he had from Omaha Beach all the way to the end of the war in Pilsen, Czechoslovakia. He's carrying a camera, while the newly-liberated people of Domazlice are carrying him. In the clip above are scenes he shot in and around the town of Domazlice, Czechoslovakia right before the end of WW II. Konop's grandparents had grown up in the same countryside that their grandson was now improbably liberating. A string of jaw-dropping coincidences brought him face-to-face with the truth of his obscured identity. It took being a Lt. Colonel of the US Army and commander of the Advance Party freeing Czechoslovakia for him to discover his roots. Only eleven villages, barely 10,000 people, comprise the Czech district of Chodsko where Konop's four grandparents, my great great grandparents, were born and raised. They all left Chodsko for America in the 1860s, settling near Stangelville, Wisconsin, about 15 miles outside of Green Bay. Konop's grandfather, Joseph Konop, couldn't read. He bought his first 20 acres of Wisconsin frontier land by signing an "X" for his name. My lineage is not royalty! But when Matt Konop entered Domazlice, Czechoslovakia on May 4, 1945 he was treated like a king. Arriving in the main square by himself and ahead of the rest of the division, he was greeted with banners in Czech with his name. Konop's first language was Czech, and the banners stated "Matt Konop -- we are liberated by one of our own!". 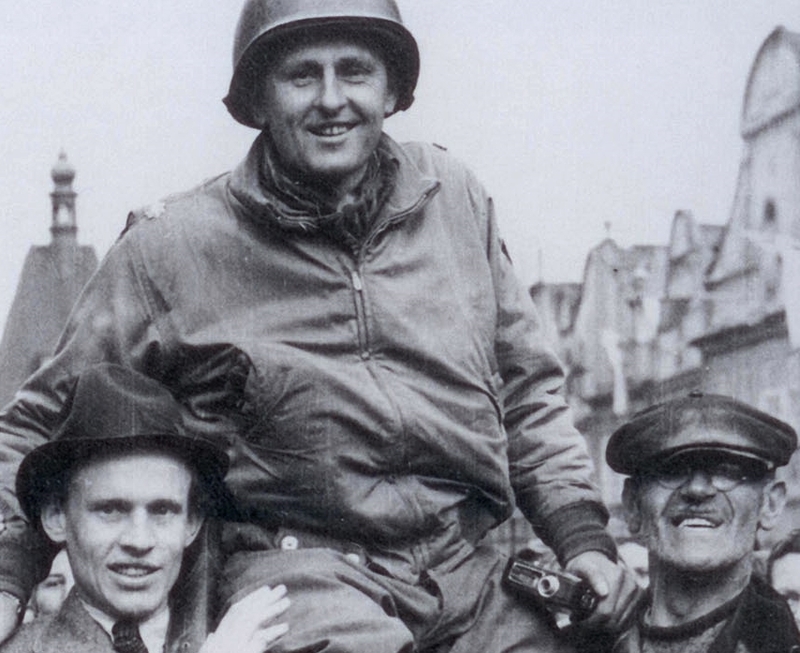 The people hoisted him on their shoulders and shouted in Czech the same thing, parading an American Lt. Colonel who had returned to the land of his ancestors. As he was being carried, the Czech national anthem, "Where Is My Home," played over and over from loudspeakers in the main square. Konop knew the song from his Czech-American upbringing, and that day was the first time in six years that the song was played in public. The Nazis had finally be quelled. And it was quite a homecoming for my grandfather, paraded on the same cobblestones where his grandparents had begun their journey to America some 80 years earlier. It doesn't seem real, does it? My grandfather never talked about it. I only found out about it when we found his forgotten manuscript. Soon after that, we found his film footage. So let the film from his camera do his talking. The music that kicks in is the Czech national anthem, and the main square is indeed Domazlice on May 4, 1945, the day that changed my grandfather's entire conception of who he was. He had spent the first 38 years of his life trying to run from his poor Czech background. He desperately wanted to "become American." And then as a Lt. Colonel in the American army at the end of the war, he discovered what it meant to be Czech. His tribe called him their liberator, but I believe they liberated him. Movie camera in hand, Matt Konop experiences a surreal homecoming at the end of WWII in Czechoslovakia, the land of his ancestors.